It’s a small manila envelope, addressed from one cousin in Texas to another cousin in Texas, and hand-delivered to me just three days ago. The size doesn’t hint at the contents — a few sheets of paper, a half-dozen photographs. One photo, in particular, of a cemetery I’d already walked, ten years ago, from one end to the other. But putting the words together with that photograph… oh my… a family mystery has been solved. I now know where my second great grandmother Isabella Robertson was buried. And more about her than I could ever have hoped to know. 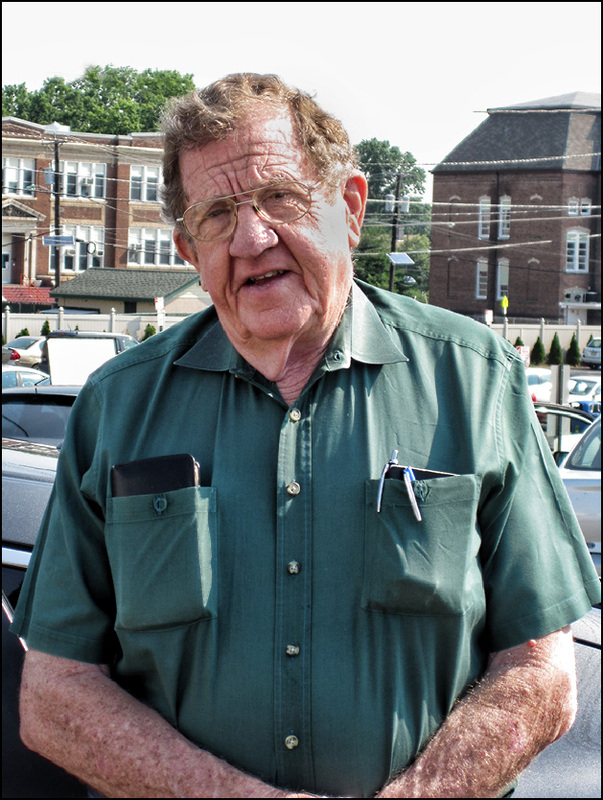 My cousin George knew his great grandfather — he was a young teenager when George Galloway Robertson died so he had the chance to talk to him about his memories of the Civil War. Of the Yankees foraging through the farms of Attala County, Mississippi, where the family lived. Of being sent with his brothers and sisters into the woods to hide until the raids were over. Of hearing the explosions from the bombardment of a nearby town. Dorothy, it seems, is interested in genealogy. She’s done some work looking at our common ancestors … and she talked to her mother, Eula Harrison Ray, about Eula’s grandmother, Isabella. • Isabella was 14 when she married Gustavus. • She was six feet tall and red-haired. • She had a withered arm from a shoulder dislocation at birth. • The slaves she owned were a gift from her father to help her with her children because of her arm. • She could read and write and wrote stories about light as it appeared in the Bible. • One of Isabella’s sons was a postmaster in Texas. 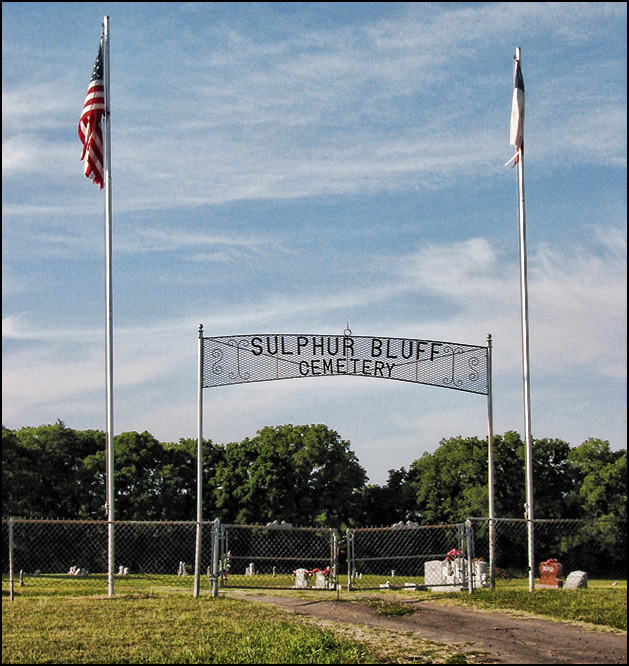 And, she wrote, Isabella was buried next to Gustavus and both were buried at the Sulphur Bluff Cemetery in Hopkins County, Texas. Now as I said I’ve walked that cemetery. 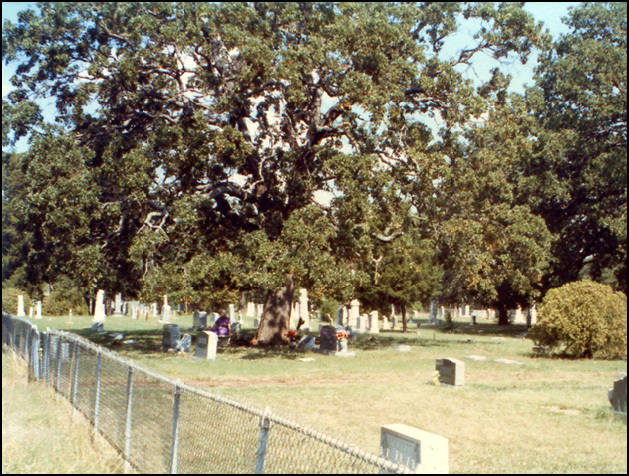 Every inch of that cemetery in 2003. A death record for Gustavus from 1903 suggested he’d been buried there. There is no death record for Isabella. But there isn’t any marker for any Robertson in that cemetery. In frustration at not finding any family grave, I shot this photo of the cemetery gates and drove away empty-handed. I was sure that I’d never know exactly where Gustavus was buried. Nobody could possibly still be alive, 100 years later, who would know. But I was wrong. Because, you see, Dorothy talked to her mother, Eula. And Eula was born in 1891.4 She was in her teens when Isabella died, sometime around 1906 or 1907. In other words … Eula knew her. Spoke to her. Was there when she was buried. Buried at the Sulphur Bluff Cemetery, between the big tree and the fence. The big tree and the fence Dorothy later photographed … and then sent the photograph to George … who then delivered it to me this week. Only about a kazillion to go. Thank you, cousin Eula, thank you many times over for your long memory and sharing what you remembered with your daughter. Thank you, cousin Dorothy, for talking to your mother about her grandmother and writing down her stories and sharing them with your cousins. And thank you, cousin George, for taking time to visit me and share these treasures of our family. Oh my, Judy, now I’m all teary-eyed—and so early in the morning for me. My grandmother, Mary Isabella, was said to have been red headed, but she was in her 80’s by the time I remember her and her hair was very white. She was fairly small in stature and she wasn’t much of a talker. I tried to talk to her about family but I was too young to know what questions to ask and I got very brief answers. I’m so glad that you now have this information! You’re up early, cousin! And I have been thinking of you the whole time since meeting George — waiting to be able to share this info! Isn’t this the neatest thing???? And cousin George says he thinks he has a photo of his great grandfather George — so we’re in the process of collecting almost the whole set! And PS: cousin Dorothy’s Mom says your grandmother’s nickname was Babe. Did you know that? Oh, Mein Gott!! I had been told that by a cousin who contacted me online several years ago and, after one response from me, disappeared. I relayed that to my twenty-years-older cousin, Mary Leila Scott, and she looked at me as if I had just arrived from Mars and said, “Nobody would ever have had the nerve to call my grandmother “Babe”!! Since she had twenty years on me and had lived next door to our grandmother all of her life until she married, I took her at her word! Picture me falling off my chair! Cool, huh? I’m scanning everything I got and will send you copies. Thanks so much, Judy. I’m looking forward to it! It’s amazing isn’t it how important those little tidbits, scraps of information, can be. All those little bits here and little bits there sure add up, Roberta! There’s no doubt in my mind, and I trust you completely. Just returned from Texas where I met my cousin for the first time. We share the same grandfather but different grandmothers. There are a lot of amazing stories in that state! It’s an amazing state, period, Charlene — bigger than life, for sure. Wow. This is genealogy by personal contact. I think it’s the “truest” kind. I’d rate it right up there with the GPS. But that’s just me. Loving and loyal people, passing down memories. Thank you, George! And what a heart-waming story, Judy!